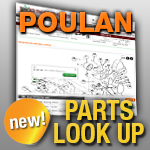 Poulan Trimmer Head Parts: Need a replacement cover or spring for your Poulan trimmer's head? What about a new bump head knob or spool to fix your bump head style trimmer head? Jack's has these trimmer head parts to help you fix your trimmer. Select the components you need below. We also carry complete Poulan trimmer heads.